Unlike his father Gaetano and his uncle Ubaldo, Mauro had a relatively brief career as a painter, and it is as a draughtsman and printmaker that he is best known. He spent number of years in France, both as a youth and as an adult, and his work can be seen as a blending of the Bolognese tradition inherited from his father and uncle with the Neoclassical manner prevalent in late 18th century France. 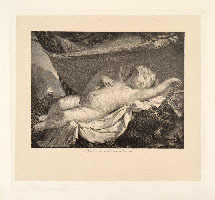 Elected to the Accademia Clementina in Bologna in 1794, Mauro seems to have largely abandoned painting around the turn of the century in favour of working as a reproductive engraver, a practice he studied during a stay in France between 1800 and 1806. He spent several months in New York an Philadelphia in 1816 and later wrote an account of his travels in America, where he notes that he brought with him finished drawings to sell, although none have as yet been identified. On his return to Italy he worked briefly in Florence before settling in Milan, where much of his work was in the form of highly finished drawings and watercolors offered for sale to collectors, as well as designs for engravings, which were published and sold by a number of the printsellers who were active in the city. Mauro returned to Bologna in 1823.